A 'three-in-one' online safeguarding course written specifically for staff in the education sector, covering child protection together with online safety and the Prevent duty. A valuable tool for staff, leaders and managers who want to instil a ‘culture of vigilance’ in their school. The course was structured very well with useful links and resources and had me engaged. The scenarios were very poignant and relevant to our working environment. I really felt this was one of the best CPD's I have experienced in a long time. I was very impressed. This online training course covers the safeguarding requirements for England, Scotland, Wales and Northern Ireland. When you begin the course, you will be offered a choice of location. Your learning channel is designed to meet the needs of Ofsted, Education Scotland, Education Training Inspectorate and Estyn, depending on the country you select. 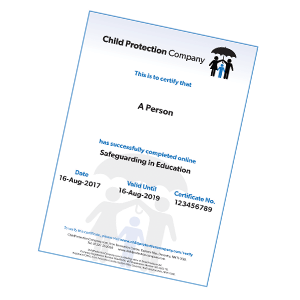 This safeguarding course offers an introduction to child protection specifically for staff working in the education sector. This includes all staff who are employed in a school setting, including admin staff, governors, teachers, leaders and managers. If you do not work in a school or education setting, you may find one of our general safeguarding courses more suitable. I work in Early Years education. Is this the right safeguarding course for me? We offer a variant of this online safeguarding training course, titled Safeguarding in Education: Early Years, which is specifically written for staff who work exclusively in the Early Years sector. Do we have to do the same safeguarding training every 2 years? We regularly update the Safeguarding in Education course to ensure that it is in line with any new legislation or policy changes. This means there will be changes when you come to retake your safeguarding training. We offer a refresher option, which means that rather than taking the course all over again, you can choose to just read a synopsis of each module and details of any legislation and policy changes. You will still need to complete the End of Course Assessment to obtain your safeguarding training certificate. This course provides an introduction to safeguarding and child protection. It focuses on a range of safeguarding issues, including abuse, radicalisation, online safety and associated areas. The content will offer guidance on how to take action in relation to safeguarding and it is suitable for anyone working in an education setting. There are also versions for those based in Scotland, Wales and Northern Ireland, to account for some regional variations in the course content. You can choose the most appropriate route at the start of the course. This short, scenario-based module is designed to help you assess your current knowledge and begin thinking about issues surrounding abuse and safeguarding that may manifest. By the end of the module, you will have a clearer understanding of your own level of knowledge. It is a sad truth that child abuse, radicalisation, cyberbullying and child sexual exploitation are all still common in the United Kingdom. This module will introduce you to the terminology of safeguarding and will define key words and concepts that will inform the rest of the course. By the end of the module, you will have an increased awareness of those most vulnerable to abuse, on what scale abuse occurs and the definitions of key terms such as ‘child’ and ‘safeguarding’. Over the years, a number of pieces of legislation and guidance have been implemented to help safeguard and protect young people and children in the United Kingdom. The purpose of this module is to help you understand what legislation is in place and why it is needed. You will not be expected to be able to quote the laws themselves, but it will help with good safeguarding practice if you have an overview of them. It is vital that all staff understand the role of the Designated Safeguarding Lead Person (DSL), so this module also looks at their responsibilities. By the end of the module, you will have a better understanding of the main safeguarding-related legislation and guidance. You will also consider the vital role played by the DSL in ensuring that effective safeguarding takes place. Module 4 - What is Safeguarding? This module will support your ability to recognise those children and young people who are potentially at risk. You will look at what safeguarding is concerned with and this will help you to define the main kinds of child abuse. It will then move on to consider the specific categories of abuse. By the end of the module, you will have a clearer understanding of the difference between child protection and safeguarding. You will also know more about the specific categories of safeguarding and the impact they can have. The increased use of technology by young people and children brings many benefits and, sadly, a few dangers. This module looks at the role of safeguarding when it comes to online safety. The content will give you an overview of the potential for risk when children are online, in relation to, amongst other areas, grooming, sexting and cyberbullying. The module will remind you of the legal position should you become aware of an incident, and will outline ways of empowering children to be safe and report issues when online. By the end of the module, you will have extended your knowledge of the risks associated with technology, the different aspects of online safeguarding in education, specific risks children may be exposed to, and effective online safety practice. All schools have a legal duty to prevent pupils from being drawn into extremism. Staff are expected to challenge extremist ideas and recognise when children are at risk, and Ofsted will expect to see school leaders and governors taking steps to protect children from radicalisation and extremist views. This module places the Prevent strategy in context and considers the ways in which radicalisation can affect a young person, and the groups that may attempt to induct a young person into their ideology. By the end of the module, you will have a greater understanding of the signs of radicalisation in young people and what to do should you feel a child or young person is in danger under the Prevent strategy. As you will have seen in earlier modules, children often find it difficult to discuss abuse and abusers can become very skilled at covering their tracks. It is therefore vital that we can recognise the possible signs of abuse. At the end of this module, you will have better understanding of the signs of physical, emotional and sexual abuse, and neglect. You will also have an outline of the professional responsibilities expected from educational establishments. The focus when working on safeguarding or dealing with potential abuse must be the safety of the child or young person. Maintaining a child focus is key to the process of identification and reporting, because unfortunately, children sometimes report several times before any action is taken. The learning you will complete in this module will be contextualised in a realistic situation, so that you can see how a child focus can be achieved. By the end of this module, you will have a better understanding of what it means to be child-centred in your approach, and the responsibilities of educators in relation to documenting decisions. This part of the course builds on the work we did in earlier modules. Children can disclose in a number of ways, so while you want to maintain confidentiality where appropriate, you also need to know when to report and to whom. It is vital that you respond quickly and appropriately when presented with a disclosure of abuse, and this module covers the right process to follow and what to do (and what not to do) to achieve the desired outcome. By the end of this module, you will have a better understanding of the correct procedures to follow in response to a potential abuse situation and will know what to do if you have concerns about the behaviour of an adult. A step-by-step guide is included, which will help you to refer any concerns you may have. You will now take all you have learned and apply it to an assessment of your knowledge. The final assessment is your opportunity to show how much you have absorbed and why it is so important to have child protection training.